Being pregnant should not hold you back from living an active and a healthy lifestyle. It is a common misconception that pregnant women should be sitting around all day with their feet up if they are to stay healthy and have a healthy baby whereas, in fact, it is quite the opposite. Studies have shown that exercise can not only be good for pregnant women, as it reduces swelling and helps with back pain but for the baby as well. There is also evidence that exercising may prevent gestational diabetes that is developed during pregnancy and increase your stamina and pain endurance during pregnancy. However, that certainly does not mean that you should be doing intense workouts so here is a small guide regarding the top seven exercises that have been proven to be safe for pregnant women. You can never go wrong with jogging. 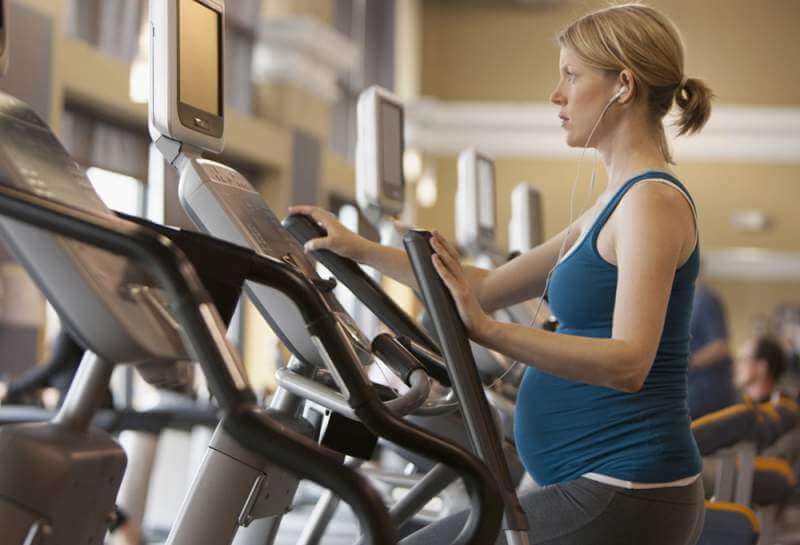 Jogging if done in moderation and at a steady pace can be an excellent exercise during pregnancy. While doing so, making sure that you’re hydrated and wearing the right shoes is essential because if your shoes are not comfortable, you might develop swollen feet that can get uncomfortable for a pregnant woman. Running on flat surface is also recommended since your center of gravity will shift as your bump grows and your pregnancy progresses in which case you might be prone to slipping and getting off balance during your runs. A quick run or a jog is also an effective way of giving you a mental and physical boost when you’re tired as well as improving your posture and reducing fatigues. However, there are some signs that you should not ignore that may indicate that you’re going too hard and may need to slow down a bit. These signs include feeling pain in your joints and ligaments during or after a workout; you’re muscles feeling sore and shaking for a long period after exercising and a feeling of exhaustion or nausea instead of energy after a workout. Another great exercise that is easy to do and requires relatively less energy than running or pacing is cycling. Not only you’ll feel more relaxed while cycling but it comes with many if not all the benefits of running without actually having to do so. 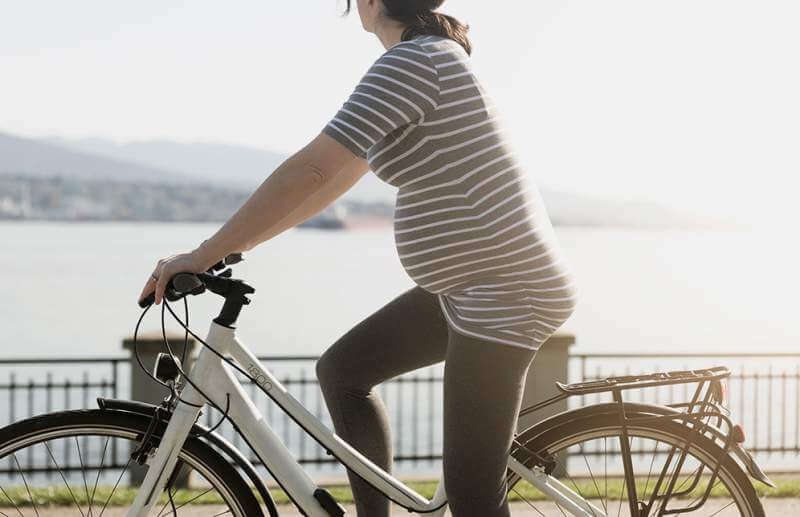 Light cycling in the morning has proven to reduce morning sickness as you intake fresh air which not only will put pregnant women in a good mood throughout the day but will also make sure that the baby is also getting fresh air to breathe. You do need to prepare yourself first and take precautions before doing so which include picking a route that is safe (avoid riding on rough, bumpy roads and trails) and listening to your body, if you feel like you’re getting tired when you reach your destination beyond how you usually feel or your muscles start to ache it might be time to slow down or quit it altogether. If you experience dizziness, shortness of breath, chest pain or anything out of the ordinary, get off your bike and contact your doctor immediately. It is recommended that you do contact your doctor before taking up cycling and take a friend with you when you do cycle or at least keep your phone with you if anything goes wrong. If you feel like you won’t be able to ride a bi-cycle or you just feel like it is a bit of a risk to take then the alternative option can be stationary biking. You won’t have to leave your place, and it virtually provides almost all of the benefits that cycling provides. It too will ease your back pain and will help in carrying the baby’s weight. It is also safer as to when a woman will be feeling off balance; it won’t have the danger of falling off your bike. It is also safer since if you’re doing it in a gym, there will be people around to help you if anything goes wrong. There are pilates classes specially designed for pregnant women that you can enroll in and they are a lot of benefits. Doing pilates will make sure that your abdominal muscles are strengthened which will do a better job supporting your growing belly and will help with in reducing back pain as well as training your body to be strong, flexible and balanced. It will also strengthen your tummy muscles which prepares your body to cope with the growing weight of your developing baby. Yoga is an excellent option for pregnant women and is often recommended by doctors too. It improves your flexibility and strengthens your core but its specialty lies in its focus on breathing and meditation exercises which foster a sense of calm. Prenatal yoga also helps in the pregnant women’s balance as the pregnancy progresses and relieves tension on lower back, upper back, hips, chest, neck and shoulders which are under a lot of stress as the baby grows bigger. Yoga also calms the nervous system it involves breathing exercises which induces your nervous system to go into a parasympathetic mode which is responsible for relaxation. Elliptical trainers are designed to promote cardio exercises and provide the sure with aerobic workout too. Using this while pregnant can not only improve your fitness but strengthen your core muscles, prevent excessive weight gain and increase your energy levels. Like with everything else though, precautions must be taken. If you’re feeling like you are over heating or the elliptical trainer is putting too much stress on your back, you should stop with the exercise and contact your doctors. During the first trimester of your pregnancy, almost every mat exercises are allowed for pregnant women. These exercises include stretching, light stand-running, and planks. These exercises are not only easy to do but come with no cost at all, and you won’t have to leave your house to do them. However as the pregnancy continues are you progress in your second or third trimester, you should proceed with caution as some exercises will not be safe anymore. Exercises like crunches and jumping jacks should be avoided in the later trimesters of the pregnancy.